In 2005, Viva La Voce Puppet Opera was founded by Vermont opera singer Roxanne Vought. According to scholar, Malgorzata Szulc, VLV is the only company of its kind left in the western world. Live singers, classical musicians and vocal actors present grand-scale opera in miniature proportions. In 2008, Ms. Vought handed the company to cast member Trish Denton, suggesting the company mount an adaptation of Madama Butterfly. 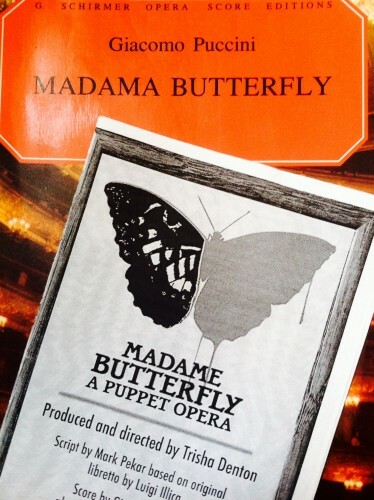 Produced and directed by Ms. Denton with an adapted libretto by Mark Pekar, Madame Butterfly: A Puppet Opera premiered at The Flynn Center for the Performing Arts in December of that year. The play featured soloists Jane Beaumont-Snyder, Susan Evans and Vickie Wycek accompanied by pianist, Annemieke Spoelstra.